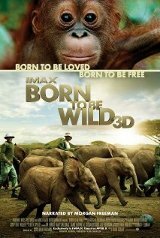 Freeman narrates the latest IMAX 3D documentary 'Born to be Wild' by David Lickley. Thanks to the clever direction by Lickley we see an interactive map of both Borneo and Kenya where our story is about to begin. We are also introduced to two women who have dedicated their lives to rescuing and adopting elephants and orangutans who have been orphaned because of the actions of mankind. Daphne Sheldrick has set up an elephant sanctuary in Kenya; many of the elephants are there because poachers killed their parents. She raises the elephants with a team of zookeepers and is the only person to successfully raise an elephant from infant to adulthood. We then travel to Borneo to see Birute Galdikas' sanctuary for orphaned orangutans. They have lost their homes and their parents due to man's rapid expansion into their territory. In both cases we experience a cuteness factor that would overwhelm just about anyone with the warm fuzzies. We see the orangutans doing cute human-like behaviours such as drinking milk from soda bottles, bathing themselves and riding on the back of motorcycles. We also see the elephants drinking lots of milk from bottles, playing soccer and adapting to their human surroundings. In the end, the captured animals are released back into the wild where they belong. The journey back home is guided by humans, the same species that orphaned them in the first place.